While I’m no stranger to RELENTLESSLY BASHING Square Enix, I instead wanted to use this picture as a jumping point for a broader topic, because to many, this kind of dungeon design in Role-playing games is neither offensive or not-enjoyable, and I don’t want to disparage anyone’s preferences. To me, the image above represents a reliable formula, something a person can expect when entering a dungeon on every occasion. I have long debated the structure and design of dungeons in Role-playing games, to the point where I have developed several specific criteria for their construction and consideration. In the future, I would love to construct some dungeon walkthrough pages using these definitions in order to highlight what I consider to be exceptional design, however, whether or not that will happen largely depends on the community response to the idea. This formula should come as no surprise, as it is a key cycle of design that can be found in numerous titles as well as genres outside of Role-playing games alone. Those familiar with Mark Brown’s commentary on game development may already be familiar with some of the ideas presented here, but I have added my own bits and pieces along the way. The introduction can be a mixture of narrative and gameplay, during which the reason for the navigation of a dungeon is established, as well as the first “gimmicks” of the area. Though the word gimmick usually has a negative connotation, its usage here is meant to imply a specific mechanic that is centralized around the dungeon area itself. Though the player may be aware of the Role-playing game motifs- combat, exploration, character progression, and environmental manipulation- the gimmick is how these motifs will be expanded upon. You may be facing down a number of physical-damage tanks, or using a series of lifts and ladders to change your positioning and move forward. These gimmicks change from dungeon to dungeon, but they should always have some sort of relevance. This is where the dungeon aesthetic often has the greatest influence: the environment surrounding a dungeon should not simply inform the wallpaper of its halls, but should also contribute something to its design. Fighting knights in a forest makes sense if there is an enemy camp nearby, but knights are also better suited for a castle-based dungeon rather than a desert. Likewise, you don’t want your desert dungeon utilizing vines for climbing unless its an oasis. Elaboration is the next step, the part of the dungeon where players begin to grow comfortable with these gimmicks through a series of specific challenges. This is the point where a new enemy type may be introduced or a specific puzzle may use the dungeon gimmick to “trip up” the player. In some cases, a new gimmick may be introduced that synthesizes with the previously established rules. But this is the bulk of the dungeon- taking what exists and running with it. In a perfect scenario, you exhaust all potential possibilities within the existing gimmicks so that the player feels as though they have mastered the dungeon. However, in some circumstances, developers will stop short right before that point so that they can integrate the current dungeon’s gimmick into a later, end-game scenario. That is a nifty little feature. Of course, the final part of a dungeon is the confrontation- you can’t finish out a large gauntlet of enemies and hazards without a big old boss battle, right? Sometimes these are narrative focused, and sometimes they take what has been established throughout the dungeon to its logical extreme. However, the boss battle can be a puzzle in itself, much like the way titles like Chrono Trigger and Octopath Traveler have players solve the weaknesses of a boss before wailing away at them. The boss defeated, the day saved (momentarily), and a prompt or warp item will usually boot the player back to the dungeon entrance- or, in an even better display, the developers may have designed a series of shortcuts that allow the player to whisk their party into or out of the dungeon. I love those sorts of designs. If we take a look back at the map screen above as well as Diddgery’s drawing, however, we can make note of a few things. First, it fails to acknowledge the gimmicks present in enemy encounters, which is an entirely valid aspect of dungeon design and a huge part of what gives these environments their personality. However, what is more important is the lack of gimmicks elsewhere. Although changing camera perspectives and pretty graphics certainly help with establishing the aesthetic of a dungeon, if it fails to feature any gimmicks that align with the environment, it is merely a hedge maze where, if a player accidentally picks all the right routes, they can reach their boss encounter in a matter of minutes. Although Octopath Traveler ensures that even a luck-based beeline will still take some time with its random encounters, the burden of creating an enjoyable gameplay loop relies almost entirely on character progression and combat, which is acceptable when these systems are exceptional, but your mileage may vary. Though this sort of formula might seem demanding, it creates what we call a gameplay loop, wherein a player can predictably fall into a sort of rhythm that minimizes thoughtless progression. When a dungeon is designed well, however, players feel a mix of interaction and manipulation of the environment as well as the ebb and flow of combat simultaneously, making them much more aware of both parts of the equation. If a player enjoys grinding and likes having a reliable area to max out experience, that’s one thing, but a dungeon can present a challenge in more than just one area. Some games use the strength of their narrative in order to subvert weaker game design, however, which many would argue is where games like Bravely Default and Octopath Traveler are stronger. I won’t comment on that, but I will present an alternative scenario: games where narrative is not as strong, but dungeon design, character progression, and combat are emphasized. Enter ATLUS games, a name likely familiar to any and all RPG enthusiasts who found themselves looking for content on the Nintendo 3DS. Or, I don’t know, if you’re a fan of that purse-owning series. ATLUS thrives on adding wrinkles to solid, turn-based RPG combat, unique character progression options, and most importantly, fantastic dungeon design. 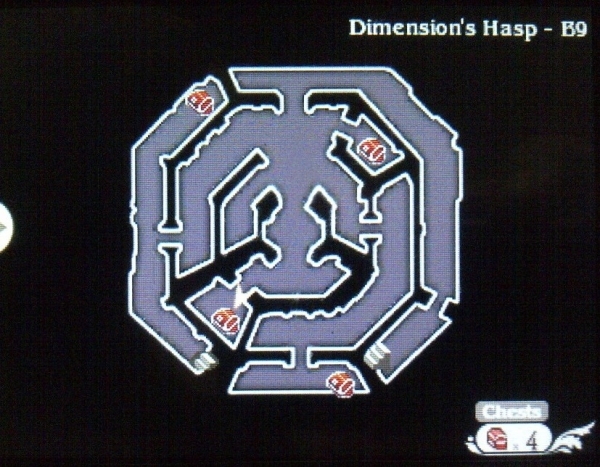 Although the example below (taken from ZeoKnight’s Etrian Odyssey V GameFAQs walkthrough) is a grid-based dungeon, all of ATLUS’ games feature examples of looping paths in order to streamline dungeon navigation, enemy gimmicks that are informed by their aesthetic, and instances of environmental manipulation. Likewise, ATLUS uses NPC escorts, gathering objectives, and side quest completion within dungeons in order to further emphasize player interaction and involvement in these environments, though as a result, their overworlds are often menu-based and shallow in comparison. To elaborate further, looking at the way Xenoblade Chronicles 2 uses bits of environment as dungeons (such as the Imperial Battleship and Abandoned Factory) shows that a narrative-focused game can also feature labyrinthine, complex dungeon maps. 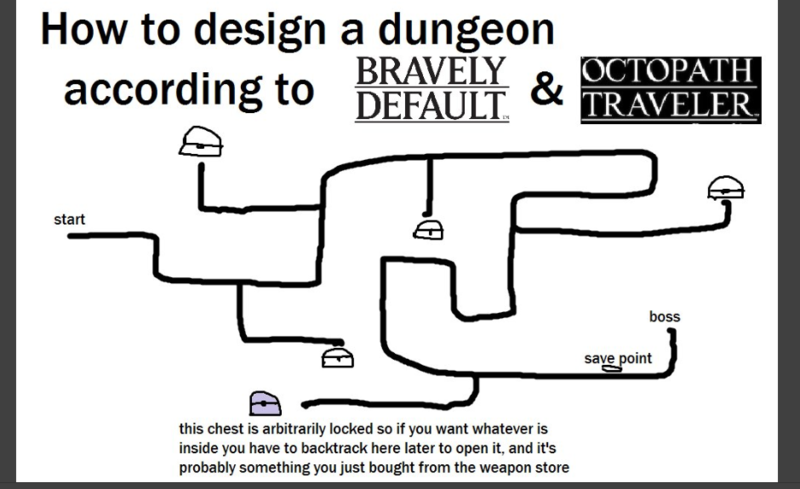 This is not to lump criticism on the design of Bravely Default and Octopath Traveler, whose strengths lie elsewhere, but a jumping point for discussion among the community: what aspects of dungeon design do you appreciate? Is it important, or even necessary in the modern RPG to have complex dungeon design? Hopefully, as we continue to review new titles and offer new content to you, we will make note of the complexity featured in dungeons and other areas of Role-playing games in order to help inform you as to whether these titles are the right fit for you- or not.